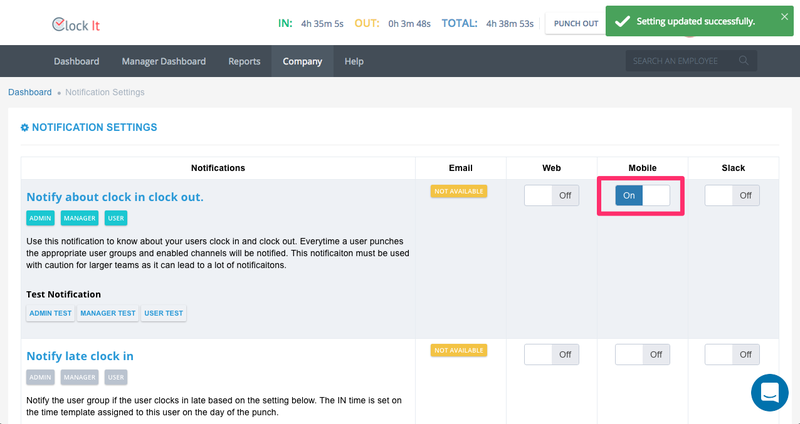 Know more about ClockIt notification settings. 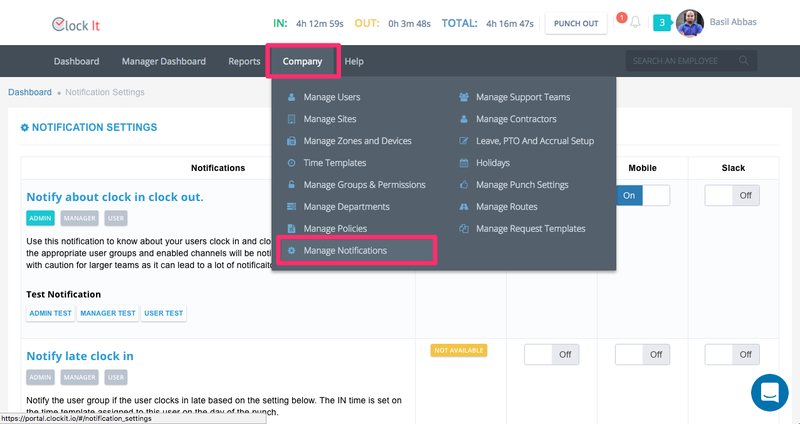 You can access the notification settings from the Company Menu. Notifications work on two core concepts. 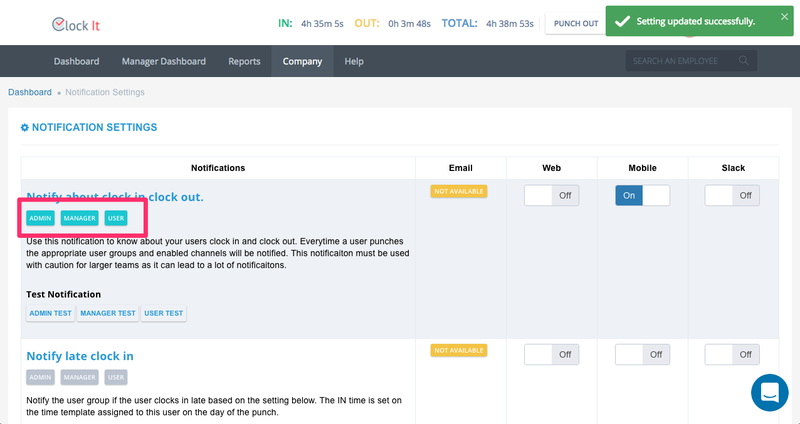 ClockIt has 3 notification groups, the admin, the manager and the user. Do not get confused with the groups in Groups and Permissions and the notification groups. They are entirely different. User groups can be turned on and off. When turned on they will be highlighted with a green. To understand the notification groups look at the structure below. John is the admin of the account. Alex and David report to John. Kevin and Peter report to Alex. This would mean that as an admin John can receive notifications for all users in the company. John is the reporting manager for Alex and David and can receive the manager notifications. 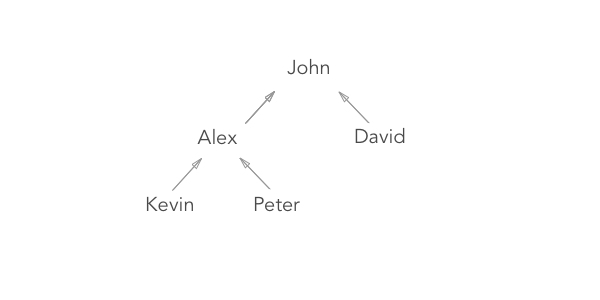 Kevin and Peter are users and will get the user notifications. 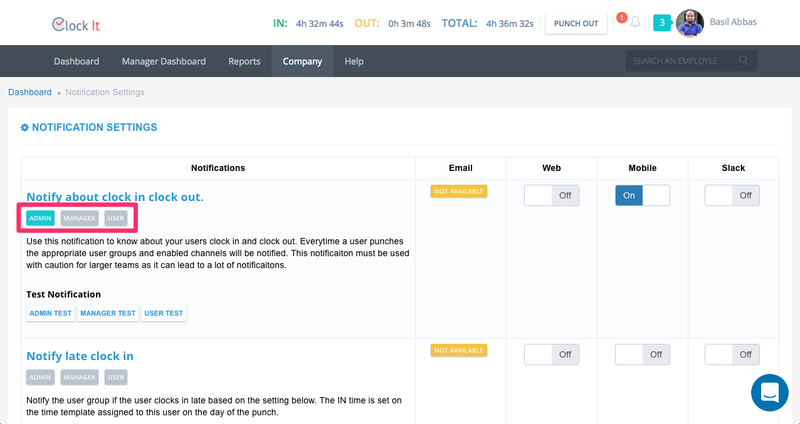 Each notification can be enabled to be delivered to a particular channel. Lets consider the first notification type and explain how this would work. Assume you set all the user groups to ON. Enable notifications for the mobile channel by turning the button on. Now if John were to punch he will get 2 notifications as he a part of the admin group and the user groups. If Alex were to punch he would get 1 notification has he a part of the user group and John would get a notification because he is a part of the manager group. John will also get another notification as he belongs to the admin group. If Kevin was to punch. He will get a notification for him self as a user and his reporting manager Alex will also get notification as he is the manager and John will also get a notification as the admin. You can test the notification messages easily by clicking on the test notification buttons. The test notifications are always sent to the person that is logged in. Please ensure that you have the mobile app and are logged in with the same account to test notifications and the mobile channel is turned on. Be careful while enabling notifications. You can very easily overwhelm your user with excess notifications. ClockIt notifications are super powerful if used correctly. Do not rush with these settings and enable all of it in one go. This can become very confusing for your users. All notifications have their own set of settings. You can set them accordingly. If you would like to use Slack to send notifications to a channel, please ensure that you reconnect slack from the integrations if you are an already existing Slack ClockIt user. If not your channel list will not be visible. Slack will be disabled if you do not connect Slack. To enable web notifications, please allow ClockIt to send you notifications to the browser.